I'm not sure he'd actually enjoy it. 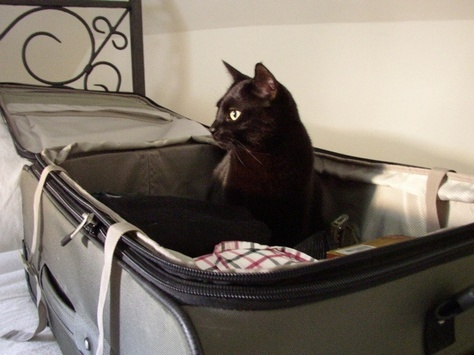 And I'm quite sure he wouldn't enjoy the flight there. My mom came to visit for a couple days last week (my birthday... damn, I'm 35... how the hell did that happen? ), and we wandered around Toronto a bit, and ate well, and shopped a bit. Good times. She also made me sit down and make a list of the various things I have to do/pack/etc. before taking off for Chicago sometime this week (driving, hence the slightly uncertain date). Since it involves leaving for seriously nearly 7 months. I was thinking I was just going to be in Russia for six months, but the extra time in Chicago for the holidays, and then a week or so in probably Germany after, and then getting back here, means that I'll really be gone for, well, seven months, basically. That kind of freaks me out. There was also knitting while mom was here. 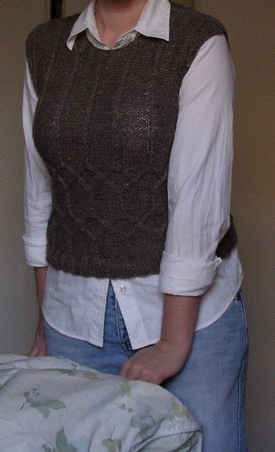 I finally finished the cabled vest. 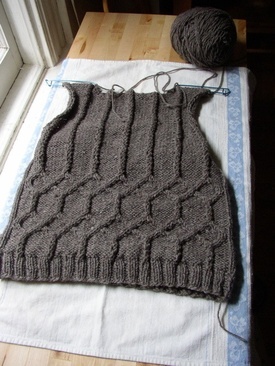 As I suspected, blocking it loosened and lengthened it sufficiently, which was fantastic. I didn't even block it very hard, really, just enough to stretch it out a bit. Excellent. If I were to do it again, I'd give a bit more length to the armholes (though they're comfortable) and definitely make the neckline scoop a bit more. I actually thought I had, but then the ribbing around it brought it up quite a bit. 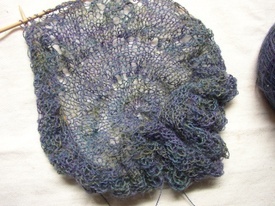 And it needed the ribbing for a nice, classic finish, I think. Ditto around the armholes. I'd thought about leaving them unribbed, but the ribbing really does make them look so much more finished. It's ridiculous. I don't love this picture, but I still think it came out pretty darned well, all things considered. And I have a ton of the yarn left over. Some of which is already making its way into something else, something that I can't yet show (though I don't actually think the recipient reads this regularly, so it'd probably be fine). In other news, after actively avoiding it because I love the original so much, I've gotten addicted to the US Office. Damn. I downloaded the first two seasons from iTunes. It's ridiculous, and painful, but now it feels different enough from the original that somehow it's OK.
Yeah, I know, that was a boring update. Variously, socks, the alpaca cardigan (I'm having issues figuring out what to do with the bottom hem), and of course travel thoughts still to come.